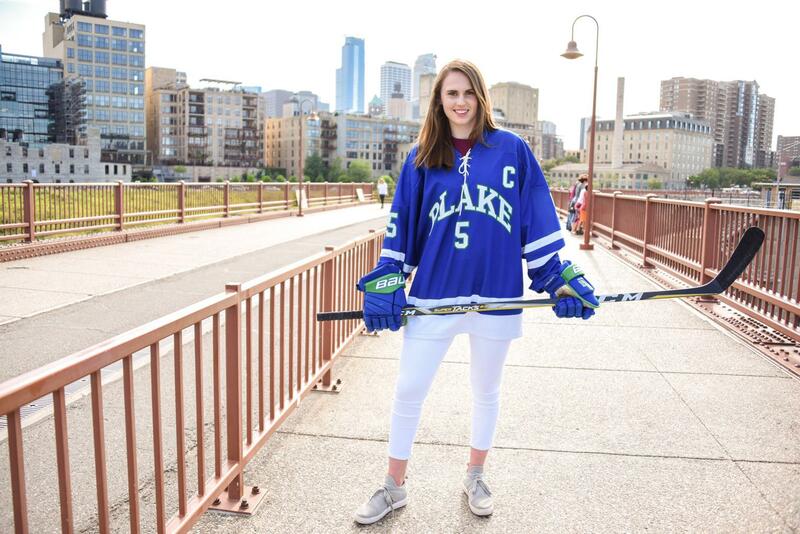 Blake senior defenseman Madeline Wethington enters the 2018-19 season as a Ms. Hockey favorite. Madeline Wethington was born to be a hockey player. Her mother was a Division I college hockey coach at St. Cloud State. Her aunts are Minnesota hockey legends. And now, the 18-year-old is embarking on her senior year at The Blake School where she has already been a part of three state championships. One of the frontrunners for Ms. Hockey, Madeline’s journey on the ice started when she was a toddler, and yet is far from finished. With aspirations that go beyond high school, her work ethic and skill will carry her to heights only a select few have obtained. Her ultimate goal? Well, you’ll just have to read our interview with one of this year’s top talents to find out. Give us your personal background. I was born July 14, 2000 in Edina, Minn., to my parents Kerry and Pat. I am the oldest of four girls (Audrey 11th grade, Jacqueline 8th grade, and Adeline 4th grade). We all started playing hockey at a young age. Audrey and I have grown up playing with each other and I am really excited to play with her in college as well! I started skating when I was 18 months old and grew up playing Mites for both Edina and Minnesota Made. I played with the boys at Minnesota Made Choice League all the way through squirts. 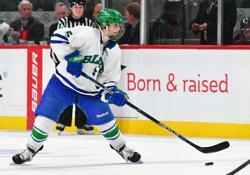 Then I played my first year of 12U on Edina 12U A and won a state championship there. In my second year of 12U, which was in 7th grade, I tried out for Blake varsity and made the team. We won the state title that year as well. I have played with Blake varsity for the past six years. At what point did you fall in love with the game? I don’t think there is a defining moment where I knew I loved the game. Ever since I can remember, I have loved the game and that is because I started being exposed to it from the time I was born. Even though I don’t really remember it, my mom was coaching college hockey at St. Cloud State at the time and I was always around the rink. My mom’s side of the family all played hockey, so I didn’t really have a choice on whether or not I wanted to play. I grew up watching my aunts Winny Brodt Brown and Chelsey Brodt Rosenthal play college hockey at the University of Minnesota. Going to watch the Gophers play every weekend made me want to be a Gopher someday. When Winny and Chelsey graduated, I would go watch them and my mom play in the WHAM league. I would either sit on the bench while my grandpa coached them or run the score clock. I was really fortunate to be exposed to the girls’ game from a young age. I think it is so important for girls to have female athletes they can look up to and be inspired by. That is why it is so amazing that girls in Minnesota now have the opportunity to not only watch college players but also professional players with the addition of the Minnesota Whitecaps this year. I think being around powerful and confident women really inspired me and made me want to follow in their footsteps. Your mom was a college coach...how did that play a role in you getting started early and falling in love with the game? I was lucky to have my mom and my grandma on the ice with me at open skating all the time at the Roseville arena and Oval when I was little. They really helped to develop my skating from a very young age and they made it fun! My mom was a PE teacher before coaching college, so she always had creative ideas for games on the ice. This is where I began my habit of saying, “When can I go skating, or shoot pucks, or stickhandle?” In the Brodt family, you put on skates as soon as you can walk. After my mom decided to step down from coaching college after my sister Audrey was born, she could give us her full attention. She always helped coach my Mite teams which was really cool because she was always the only woman out there! Looking back at it, it is so inspiring to see how confident she was with all the male coaches on the ice and teaching all the girls and boys. Because I have three younger sisters, she decided to stay at the Mite level with all of them so that was the last official time she coached one of my teams. I can always count on her to give me advice if I ask for it and be my biggest supporter. My mom would never yell or say negative things about my play. She would let me figure it out on my own which helped me to take accountability and deal with my mistakes. She would always ask, “how do you think you played?” but that is about it when it comes to talking about hockey. She is first and foremost my mom. If you didn’t know her well you probably would never have guessed she was a Division I college coach who started the first women’s hockey program at St. Cloud State. What sort of role models have your parents been for you? They encouraged us to try a lot of new things, whether that was singing in our church choir for eight years, juggling club, recreational soccer, flag football, playing the flute, going to a French immersion elementary school, slalom water skiing, snowboarding and playing golf. I think they taught me to value being well-rounded and busy. My parents have shown me the importance of education and that being smart is cool! I have been really fortunate that my parents have valued my education just as much as my hockey career. Even though my dad did not grow up in a hockey family, I have always looked up to how hard he works on his career, his health, home maintenance and family. My dad and I joke that we are “travel buddies” because he is always the one taking me to my away tournaments. My parents are by far my biggest supporters and friends. They have sacrificed so much for my sisters and me so that we had the opportunity to do the things we love. What was youth hockey like for you? Youth hockey was so much fun and a time that I won’t ever forget. I loved growing up and playing with the boys especially. I think this sparked my competitiveness and to not back down against anyone. I remember always having to get dressed in the referee locker room because it served as the girls’ locker room. My 10-year-old self didn’t want to back down against the boys and didn’t want to lose to them, didn’t want to only keep up with the boys but to be better than them! I think this really developed positive habits like hard work and competitiveness. It is really cool to still be friends with some of the guys I grew up playing with and seeing a lot of them succeed in high school and beyond. I decided to switch over to girls' side in my first year of 12U. It was so fun to be a part of a full girls' team. The team camaraderie and spirit is like nothing I had ever experienced before. That year we won State and looking back at the roster, most of the team ended up playing D-I hockey. It was great getting to become friends with girls who I now play against in high school hockey. When did you know you were really good? I have always just focused on myself and making sure I’m the best player I can be. Throughout my high school career, I knew I had to keep my foot on the gas pedal when it came to my development. I know I have a ways to go to accomplish the goals I have for myself. There are so many talented girls that I have played with and against in both Minnesota, nationally, and internationally! I can only control the controllables which are my effort, dedication, nutrition, strength, conditioning, attitude, and being the best teammate I can be. I think my biggest strengths have always been my hockey IQ and competitiveness. I always am a student of the game and love to watch film on myself and others. As a defenseman, it is so important to make a good first pass out of the zone. I am a big believer in the idea that great defense leads to great offense. So as a result, developing the play starts in the defensive zone. I try to give my forwards the best opportunity to score by creating plays and buying them time with the puck. For me, getting an assist on a play I started feels just as good as scoring a goal. What areas of your game do you feel you need to work on? I want to continue to develop my overall game. I try to train by the belief of getting 1 percent better every day. It can mean going to shoot pucks, lifting or even being conscious about what I’m putting in my body. Every year my goal coming into the high school season is always to be stronger and faster than I was the previous year. Lately, I have been focusing on being comfortable walking the blue line and being a threat to shoot, pass or even skate around the opposing forward. I think honing down on this skill can help to make me a more well-rounded player and add to my offensive skill set. Tell me about your experience at Blake, from when you first came up to the varsity team until this year. I have been fortunate to be a part of a great and historical program. It has been awesome to play with so many talented players in my six years and to see a lot of them have successful careers in college. The best part about playing for Blake is having the opportunity to represent all the girls who carved the way and made the program what it is today. Going to the rink and playing with my classmates is by far my favorite part of the day. It has been really exciting to be a part of the first AA girls' hockey team at Blake and I can’t wait to have another great season! What do you do off the ice to prepare yourself for the season? My sister and I work out five days a week together in the summer with our trainer Jayme Pantekoek at Full Strength/Speed in Minnetonka. Three of the days we lift while the other two days we focus on speed interval training. I like how balanced the program is with the intention of gaining both strength and speed. To be a threat on the ice you have to have both strength and speed. It is really fun to get to lift with my sister and a bunch of other college and professional hockey players. The environment is a lot of fun and really supportive. At the same time, I know it pushes us to develop ourselves both as players and people. In the summer, I shot with my cousin-in-law Ethan Prow. He has really helped to hone in on my techniques and has taught me some really great tips, especially for a defenseman. He’s also such a great guy and has an amazing shot. I don’t know exactly, but I am hoping to still be involved in hockey. My ultimate goal is to play on the Olympic team but I also want to become a doctor. So I am hopefully going to try and do both! I am going to the College of Biological Sciences at the University of Minnesota. I am still undecided on my major but something along the lines of cellular biology. I want to get my prerequisites for medical school. What do you do off the ice for fun? What are your hobbies? I have been on the varsity golf team since 7th grade and it is something that I love to do. It is a complete change of pace from hockey and helps to rest my body. I shoot lefthanded and swing righthanded; this helps to even out my back! But most impor-tantly, golf has taught me mental toughness. Golf is so different from hockey in the sense that you have nobody that you can count on besides yourself. I have complete and utter respect for professional golfers because of that! In the summer, I love to go to my cabin with my family. We spend a lot of time out on the lake slalom skiing, wakeboarding, paddle boarding and tubing. It’s a great break from our busy training during the week. When I’m just trying to relax, I like to read books or listen to music. Describe your experience playing for Team USA. Anytime I get the opportunity to play with Team USA is a complete honor. There is no better feeling than getting to have the USA crest on your jersey and represent the greatest country in the world. I have been so fortunate to play with and against so many talented players. Every time I come home from attending a camp or tournament, I have learned so many new things. I try my best to soak up all the information and advice I receive. Having the opportunity to learn from so many great coaches and staff has not only helped my development as a player but as a person. The culture that the national team has instilled has impacted my views on what makes a good teammate. Just having the saying “we are a part of something bigger than ourselves” really showcases the mentality of putting the team above any individual accolades or accomplishments. Describe the feeling of being a state champion. It was a big dream of mine ever since I watched my cousin Hanna Brodt Prow win a state championship with Roseville in 2010. Getting to watch players like Olympian Lee Stecklein and my future college coach Bethany Brausen play made me want to win one someday. It was so incredible to win with some of my best friends in front of such a supportive community. Ultimately, I am so lucky that I have had the opportunity to continue the legacy that so many great Blake players started. How has Coach Reid helped you in your development both as a player and as a person? I can’t give Coach Reid enough credit for my development as both a player and person. These past six years have gone by so quickly and he has always been there pushing me to be better. We are so lucky to have Coach Reid at Blake. He is very committed to growing the girls’ game which you can see with him taking over as President of the Minnesota Girls High School Hockey Coaches Association. He constantly tries to see the bigger picture which is to make us better people. The values he has taught me like hard work and passion are something that I will take on with me as I move forward. He is a dean at our school and his door is always open. I know that when I am having a bad day or simply just want to talk hockey he is always there. What advice would you give to young female hockey players? My advice would be to play for the love of the game. Remember, you are playing hockey for yourself and not to please your family, coaches or even friends. You will only get so far if you don’t truly love it or are doing it for other reasons. This can apply to any aspect of your life. Hockey should always be fun, but it will also require a lot of hard work. If you want to get far, you have to be willing to sacrifice things. There will be times when you have to miss events like a football game or a concert. Hockey should not be a hassle or something you don’t want to go to. I realized I loved hockey when I wanted to play it more and more. Eventually, I was fine with missing that football game or concert because I knew I was having fun playing hockey with my best friends. Yet, it is also so important to find balance. Too often, kids are now specializing in a sport. I encourage you to play as many sports as you can or even be in a choir, debate team or theater production. It’s a lot of fun and makes you a more well-rounded person. Win a AA state title and be the best teammate I can be. What are your future goals in the game? Win a AA state championship, a national championship, and ultimately play in and win a gold medal in the Olympics. Madeline is a passionate hockey player and all-around awesome person. She has been with the program since 7th grade and has been extremely impactful from the first day. Madeline has great talent, vision, tenacity and really all of the traits a coach wants in a player. Her speed creates separation when she has the puck and allows her to track down or close the gap quicker than any player. She is also eager to learn and works to improve herself every day by lifting weights, shooting pucks, stickhandling, etc. She is one of the most dedicated hockey players I have ever coached. I fully anticipate her having a dynamic senior year at Blake, then excelling at the U of M and having a legitimate shot at playing in the 2022 Olympics. Now that there is a viable professional hockey option for women, I would not be surprised if she builds a professional hockey career. No matter what her future holds though, her intelligence, incredible work ethic and intentional focus to improve in every facet of her life will ensure that she is quite successful.